Per Anders Nilsson, PhD, Gothenburg, Sweden – Professor in Music and Media at Academy of Music and Drama at University of Gothenburg, and holds for the time being a position as Vice Prefect for Research. Improvising musician and composer. Studied saxophone and electroacoustic music from 1981-87 at the University of Gothenburg. 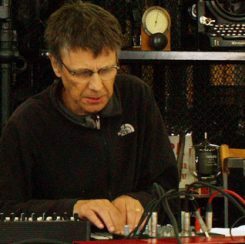 In 2011 Nilsson defended his doctoral thesisA Field of Possibilities, which is about designing and playing digital musical instruments. Nilsson has been played at several ICMC, and was music coordinator for ICMC 2002, has been commissioned at GRM, Paris, and has also been a visiting scholar at CNMAT in Berkeley, CREATE in Santa Barbara as well as CCRMA at Stanford. Nilsson and Palle Dahlstedt are currently running the research project “Systemic Improvisation” supported by the Swedish Research Council. In the 70s and 80s he managed his own bands. In 2009 Nilsson toured Sweden with the legendary saxophone player Evan Parker, and in 2014 Nilsson toured Sweden with British free improv group AMM.